I’m back with my take on the 2004 film “Mean Creek”. Directed by Jacob Aaron Estes and starring a fantastic young cast that was recognized at the 2005 Independent Spirit Awards. This movie tells the story of a middle school bully who gets taught a very serious lesson from a bunch of neighborhood kids. This is a very powerful and disturbingly real drama about kids who get in way over there heads. Sam, played by Rory Culkin, is beaten up by George the fat school bully for basically doing nothing. When he gets home and tells his older brother, they devise a plan to get back at him. With the help of some friends and Sam’s young girlfriend Millie, they invite George on a boat ride for Sam’s faux birthday party. He agrees and thus starts the beginning of the end for this foul-mouthed outsider. The way all of the characters are portrayed and developed is the strength of this small indie film. The story is grounded in such truth and believability it is quite shocking. George the bully is played marvelously by Josh Peck. He is more than you stereotypical bully. He has trouble making friends and relating to kids his age. He is dyslexic and tries to be one of the gang without actually being himself. This results in him coming off as an awkward foul-mouthed ball of anger and confusion. Halfway through the boat ride, Sam and the others decide that George is a misunderstood kid and doesn’t deserve what’s coming to him. Sam’s brother's friend is not convinced and wants to proceed. His brother is shown to be a bully in his own right and this is a big reason why he wants to continue with the plan. In a game of truth or dare George is backed into a corner when dared to strip and jump overboard. He refuses and then goes on a vicious tirade ripping into each of them. He is pushed into the water and can’t swim. Everybody in the boat freezes as they watch him struggle to stay above water. When they finally try to save him it’s too late and he drowns. What are they going to do now? The kids deal with the situation in a sort of quiet and contemplative panic. What will this mean for the rest of their lives? The majority of the group wants to bring the body back and tell the police what happen. The older guys want to bury the body along with the truth, and that’s what ends up happening. It’s a game of self-preservation versus honesty and responsibility. Once back at home the younger kids’ band together and decide to tell George’s mother the truth. 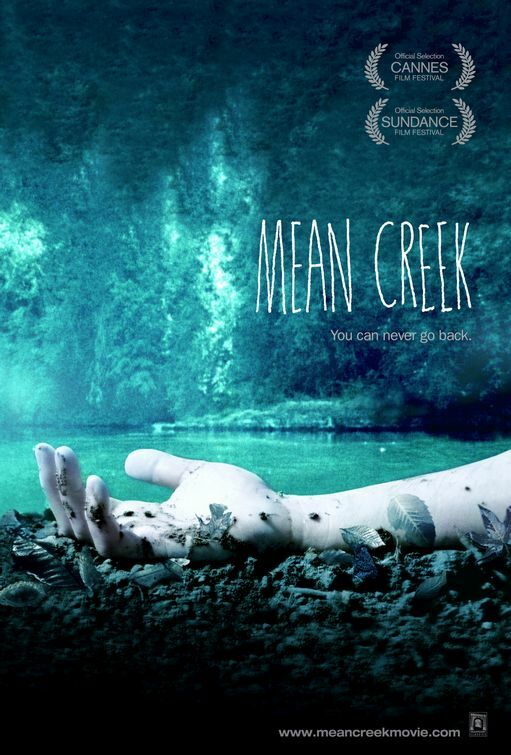 “Mean Creek” is a remarkably well-made film and is heartbreaking to watch. The themes of bullying by kids at school and by family members are brought to the forefront and painfully executed. The DVD also includes a director and cast commentary. This movie is well worth a rental if not a buy.